A collection of the wildest conspiracies to ever exist, from mind control experiments to lizard people, this book explores, debunks—and sometimes proves—the secret stories that don’t quite make it into the history books. What's fact and what's fiction? With conspiracy theories, sometimes it's hard to get to the truth! 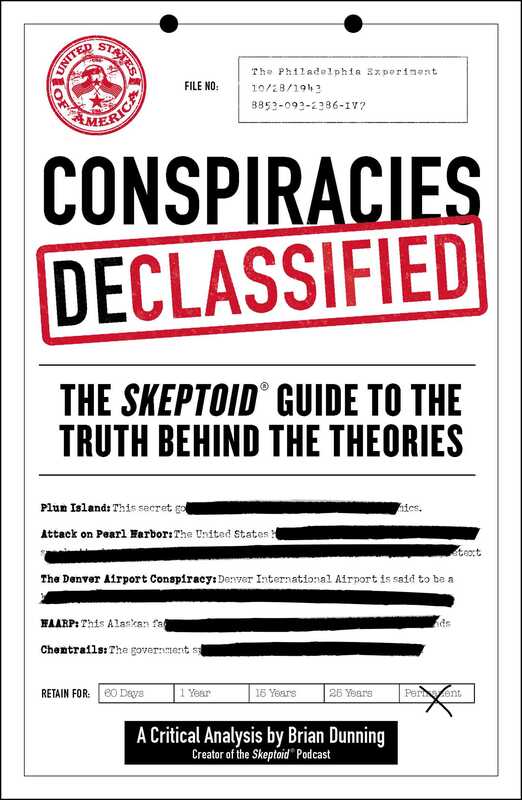 In Conspiracies Declassified, author and expert skeptic Brian Dunning explains fifty true stories of famous conspiracies throughout history. From the moon landing hoax, to chemtrails, to the mind control dangers of fluoride, Dunning is here to sort the truth from the lies to tell you what really happened. – Michael Shermer, publisher of Skeptic magazine, and monthly columnist for Scientific American. – Dr. Joe Uscinski, coauthor of American Conspiracy Theories. "Is Conspiracies Declassified for you? Poke your head out from under your bed and find out."